Last week I celebrated 10 years of blogging over at Recklinghausen Musings with a layout I shared here too (see post here). But it made me realised that 10 years ago was the day we travelled to Nova Scotia for our "beach holiday" and it's got the best memories. 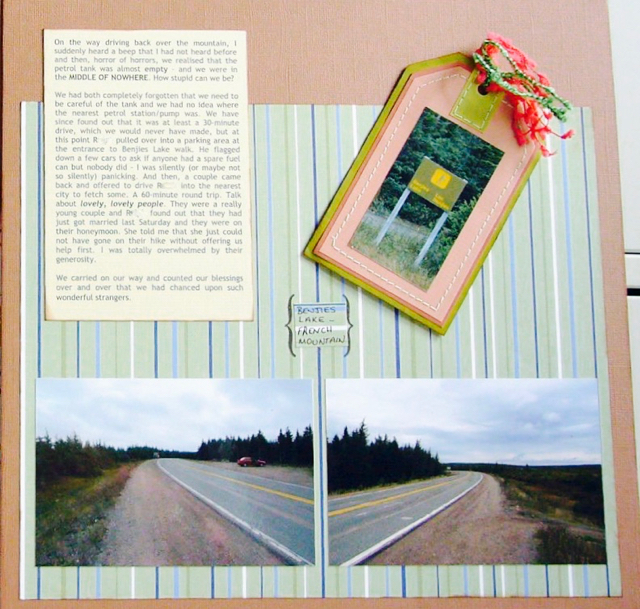 It's encouraged me to look back at the blog posts and the album I made. Being new at scrapping and enthusiastic beyond my talents (!!) I made a full 12x12 album of that holiday and used my blog for the journalling. So looking back, I can see that 10 years ago today would appear to be the day that we had a minor emergency scare that gave us an insight into what lovely people the Canadians can be. We were helped out in our hour of need by complete strangers. My blog post title says it all "NEVER underestimate the kindness of strangers"
For prompt WM#230 I'd like you to be inspired by just that. Be inspired by the kindness of strangers. This might be a difficult one to scrap because it's unlikely that you have photos of strangers or maybe you've never needed the help of one in particular. But think about getting lost in a town, being a helpless tourist on holiday, even someone giving up their seat for you on the train or bus. Your reaction to the situation might be an interesting direction or maybe you were the stranger helping someone else out. Even though you might have to get creative with the photographs, using something symbolic perhaps, I really think there are a few directions you could take this. just one page of three from this eventful day and look at that beginner style! *sigh* for Chatterbox papers though! You can either upload your layout into the Whimsical Musings Flickr gallery with the tag WM#230 or you can post it in our Whimsical Musings Facebook group. We've decided that we'll save albums for special occasions so just load up your photo to the group with the tag WM#230 in the write up text so that we can find it.